One of the earliest attempts to use the principles of statistics and probability to understand infectious disease was made by yet another member of the Bernoulli family. In a paper published in 1766, Daniel Bernoulli used census data and statistical methods to study the advantages of variolation or variolization as inoculation against smallpox . In a process originally developed in Asia, smallpox scabs were dried, ground, and inhaled by people, who then contracted, hopefully, a mild form of the disease. Approximately 2% of individuals who contracted smallpox by variolation died compared to 30% of those normally exposed to the disease. where P is the total number of population of coins and pheads is the probability of a coin landing heads (pheads = 0.5). Compartment models are mathematical models designed to describe the transport of information, material, energy, heat, etc., between and among the various compartments of a dynamic system. Formally, a dynamic (or dynamical) system is any system wherein objects interact by a fixed set of rules or equations that describe the time dependence of the state variables of the system. For example, a system of planets orbiting a star is a dynamic system where the position of each planet varies with time in accordance with Newton’s Laws of Motion. Compartment models were first introduced by Jay Wright Forrester who developed them for the field of Operations Research. Forrester is credited as the father of System Dynamics. Compartment models have been applied to the study of dynamical systems in fields as distinct as manufacturing (workflows), systems biology, environmental studies, economics, politics, engineering, and medicine. First published in the Harvard Business Review in 1958 , Forrester’s work establishes a paradigm that can be applied wherever one wants to describe how a system changes in time. The models we have discussed so far represent the evolution of an infectious disease in time only. None of them represents the geographic distribution of people or how they move about in space. A compartment model that deals only with the trajectory of a disease in time implicitly assumes that the population (or populations) in question is so well mixed that there is no need to model the spatial distribution of people. However, for very large scale simulations, the details of population distribution, transportation, trade, even wild bird migration can all be important factors in understanding the evolution of an infectious disease in space and time. where the sum is taken over all sites k. The vectors that connect different locations are represented by the set of mjk. Connections need not be only between adjacent locations. For example, air travel map provide connections between distant sites. Common Border Edges with Common Border Labels are used to compute the circulation of people between neighbors by mixing as described above. 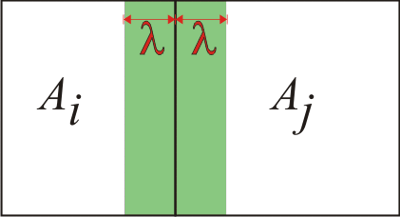 Common Border Edges are based only on geometrical and geographic facts. In the future STEM will also provide Edges that model motion specific to particular populations or species. These new Mixing and Migration'' edges will associate a transportation rate with the population by name. Not all administrative regions are the same size. The STEM model for mixing or circulation of a population scales the mixing rate by an effective depth λ for each region. This is analogous assuming a skin depth or average mixing length scale. 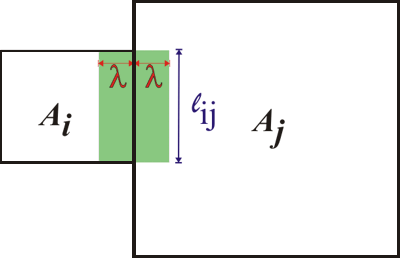 The figure below shows a simple example of two adjacent nearly square regions of area Ai and Aj respectively. Where the average mixing length, 𝜆o, is determined as part of an optimization process. Typically we find 𝜆o ≲ 45km.